This paper confronts the tractability problems that accompany IPV auction models with multi-unit bidder demands. Utilizing a first order approach, the asymptotic properties of symmetric equilibria in discriminatory and uniform price auctions are derived. It is shown that as the number of bidders increases, equilibrium bids converge to valuations in both discriminatory auctions and uniform price auctions where the price paid is determined by the lowest winning bid, thus indicating that the limiting case of these auctions correspond to price taking as in neoclassical models of consumer behavior. However, when the uniform price paid is tied to the highest losing bid, price taking behavior does not ensue and ex post inefficient allocations ares possible. The impact of our results on analysis of k-double auctions with multiunit bidders demands is also discussed. 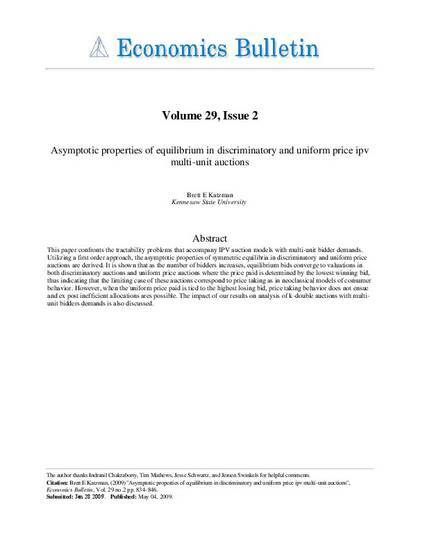 Katzman, Brett E. "Asymptotic Properties of Equilibrium in Discriminatory and Uniform Price IPV Multi-unit Auctions." Economics Bulletin 29.2 (2009): 834-846.